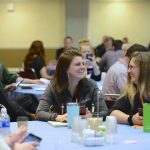 Before most Empower 2014 attendees could even unpack their suitcases, the Simplicity 2.0 blog offered its take on the latest Laserfiche conference. Mobile technology, process automation, social media and community were identified as the conference’s four main themes, and I couldn’t agree more. Why these four themes and not four other themes? How do these themes relate to one another? Why these four themes at this conference in particular? The fact that these ideas came together at Empower 2014 is more than coincidence—it reflects the evolution of Laserfiche. Initially, Laserfiche set out to solve the problem of paper clutter in the workplace. With document imaging and document management technology, overstuffed folders and rooms full of file cabinets began to disappear. Today, Laserfiche has more on its radar than paper. Through business process management (BPM) and business process automation (BPA) software, Laserfiche changes how information moves through the organization—not just the format in which it’s stored. By developing tools that allow users to easily design their own workflows and forms, we’re transforming office work once again—it’s becoming, dare I say, fun and imaginative. At last year’s conference I was introduced to Laserfiche Forms. This year I’m excited to master them!!! Edge of my seat at #empower14 !! At Empower 2014, customer speakers demonstrated Laserfiche Mobile applications on iPhones and iPads; attendees used their smartphones to network, take photos and tweet; and Android users were happily welcomed into the Laserfiche Mobile family. Mobile technology adds a sense of delight to the ECM experience. With Laserfiche Mobile, users can manage documents and processes through their beloved devices, in any environment. The freedom of mobility means two things: you don’t have to be stuck in an office to get work done, and ideas that spark unexpectedly can be immediately captured and communicated. There’s an element of pleasure in using smartphones and tablets, in knowing you can access thousands of documents through a pocket-sized device. By focusing on mobile capabilities, Laserfiche is making products that are as delightful as they are useful. 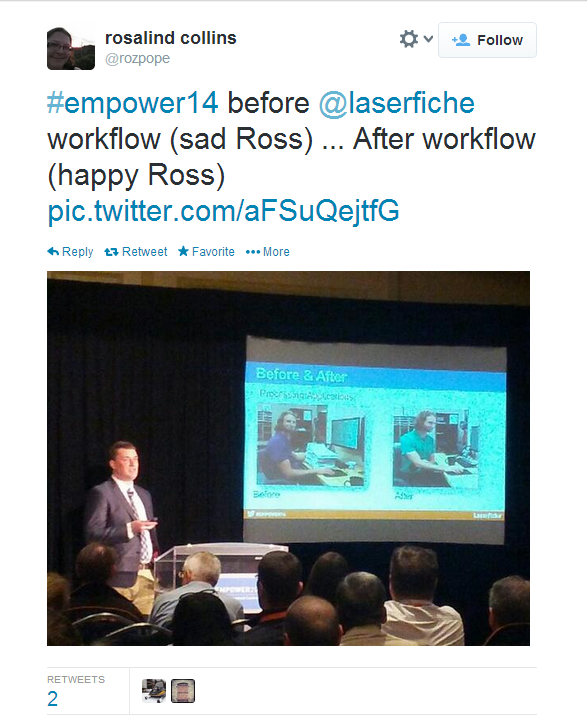 Before attending Empower 2014, I had always thought of products like Laserfiche Workflow and Laserfiche Quick Fields as “set it and forget it” process automation tools. Then I attended Doug Miller’s workflow design class and got the customer perspective. “Laserfiche is addicting,” Doug said. “You’re always thinking, ‘What’s the next project we can work on?’” Is it just me, or does that sound like excitement? Doug’s presentation shattered the “set it and forget it” lens through which I had viewed Laserfiche’s BPA tools. We “set and forget” things we don’t want to do, but products like Laserfiche Workflow and Laserfiche Quick Fields have more value than process automation; they are more than a means to an end. These automation tools are a means to a process, to a new way of thinking about how business is done. Instead of doing something because that’s how it’s always been done, Laserfiche users are empowered to build and constantly improve their own processes. It’s not just about office efficiency—it’s about office happiness. Many organizations aren’t sure how to tackle social media. Industries from commercial to government are expected to participate in this frenzied, ephemeral public arena, but making sense of it can be intimidating. 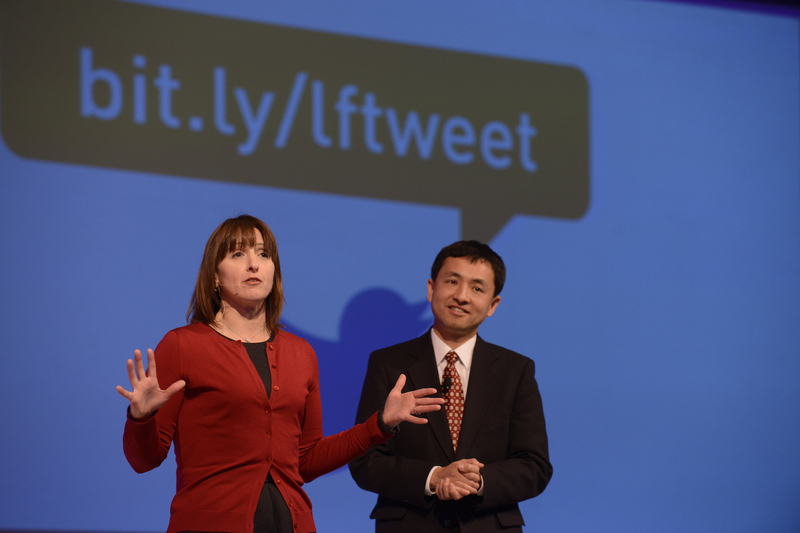 During the Day 1 Keynote at Empower 2014, Laserfiche CTO Karl Chan demonstrated how Laserfiche 9.1 can simplify social media tasks like submitting and approving tweets for a company account. Conference attendees wasted no time in testing out the process, submitting tweets to a Laserfiche community page throughout the keynote speech. By making this process easy and automated, Laserfiche helps social media novices and overburdened social media account managers gain control of these complex and powerful communication channels. At Empower 2014, Laserfiche launched a new community site called Laserfiche Answers. Though the site primarily functions as a Q&A forum, a quick tour through Laserfiche Answers reveals a deeper purpose. The interface is bold and simple with only five navigation tabs and no drop-down menus. Users can browse easily by new or trending topics. Profile photos for each member are given prominence, giving a face to every question and answer on the site. Finally, with gamification elements like badges, reputation scores and leaderboards, the site aims to identify Laserfiche experts and motivate participants to interact regularly. Laserfiche Answers isn’t just a place to talk shop. It’s a place to develop your reputation within the Laserfiche community and have fun while doing so. Now THAT’S something you don’t see every day in the ECM industry. 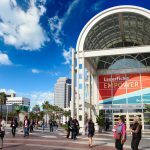 Empower 2014’s themes of mobile technology, process automation, social media and community reflect how Laserfiche is being used and developed today. With digital content becoming more standard in business operations, Laserfiche continues to find new ways to improve office infrastructure and stretch the imaginations of its users.